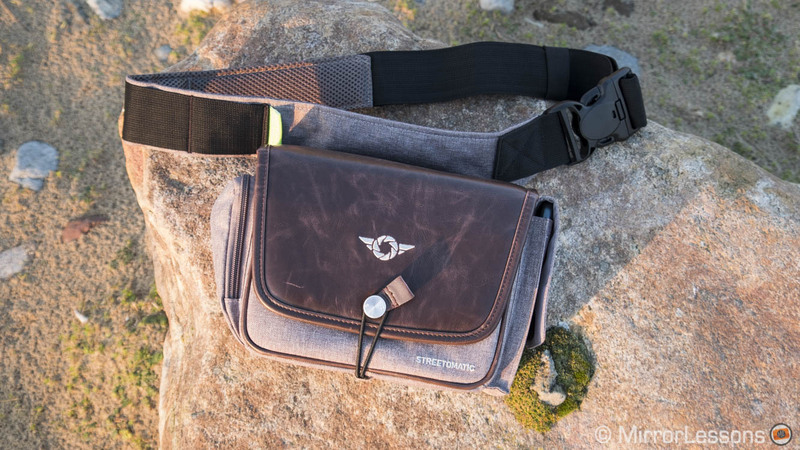 We had the chance to test the very first Camslinger belt bags by Cosyspeed a few years ago, and since then the brand has matured, creating products that stay faithful to the concept of carrying around just the essentials in a comfortable way but with a more refined design. 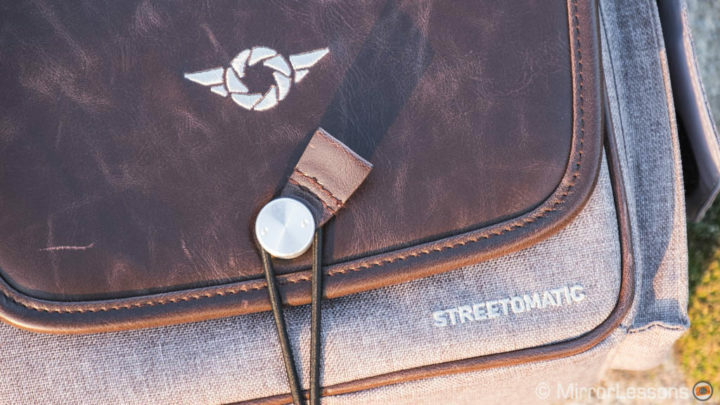 Last year we reviewed the second generation of these bags – the Streetomatic – and today we’re having a look at the Streetomatic+ which comes with an upgraded design. Unlike the previous version, the Streetomatic+ comes in only one colour. The main body is grey and made of Duo-Tone Nylon 600D, while the brown flap is made of PU Veggie Leather, a material used in the car industry. This new colour combination certainly gives the bag a stylish appearance, making it suitable for outdoor, urban and more elegant environments. It’s the best design the German company has conceived so far. 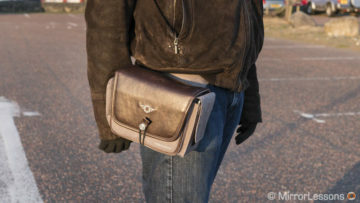 Overall the bag feels very well-built and the interior is thick enough to protect your gear from occasional bumps. The outer materials are water resistant but if you find yourself in heavy rain, there is a rain cover provided with the bag. The bag is water resistant but a rain cover is provided for more harsh conditions. Another update is the closure, which is a combination of the first and last generation of Cosyspeed bags. The elastic bungee cord is back to give extra security but instead of the old Texan knobs you had to pull, you simply slide the buckle to the right and lift the flap. 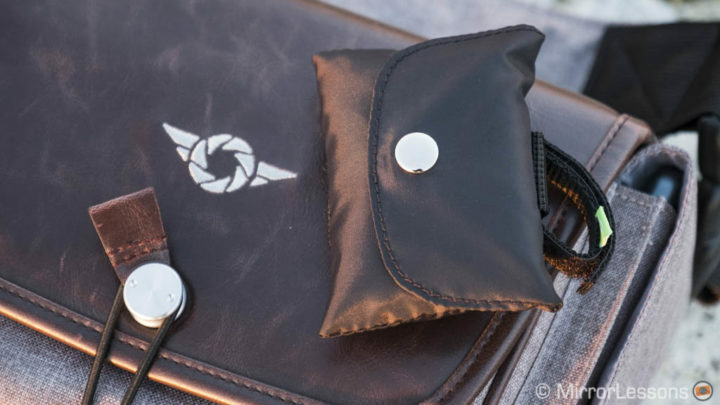 To close it, simply snap the flap back into place and the magnet will make the buckle close automatically. It’s clever, very effective, and definitely the smartest closure idea Cosyspeed has come up with so far. As usual with these bags, the opening/closing action can be done one-handed in a matter of seconds, which has always been a primary characteristics of these bags. To open the bag, simply move the buckle to the right and lift the flap. On the side you can find two external pockets. One has a flap secured with velcro and is large enough to accommodate an iPhone 7 Plus. Alternatively this is where I place spare batteries. 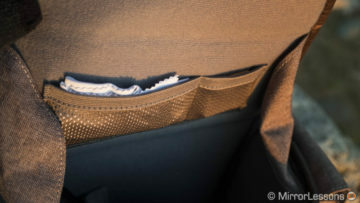 The zipped pocket on the other side has a smaller inner compartment: here I usually place a cleaning cloth and a small air pump. Inside the main compartment, you will find a third pocket where you can insert SD cards, a cleaning cloth or business cards for example. The main opening has two flaps on the side to keep water or dust out of the interior. The interiors are made of soft brushed tricot and four dividers are provided. 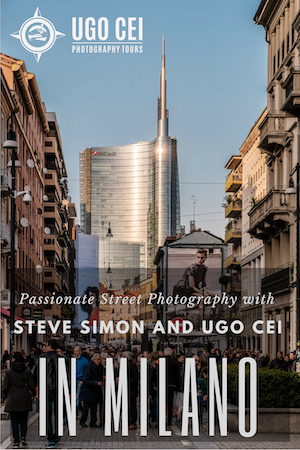 A good example of what you can carry in the Streetomatic Plus is a camera with one lens attached and an extra prime. Below you can see an image with the X-T2, 18-135mm and XF 35mm 1.4. A similar configuration can be made with the a6500, 18-105mm f4 and a small prime lens (35mm 1.8 or 55mm 1.8 for example) or an E-M1 with 12-40mm Pro and 60mm macro. There are two ways to carry the bag. 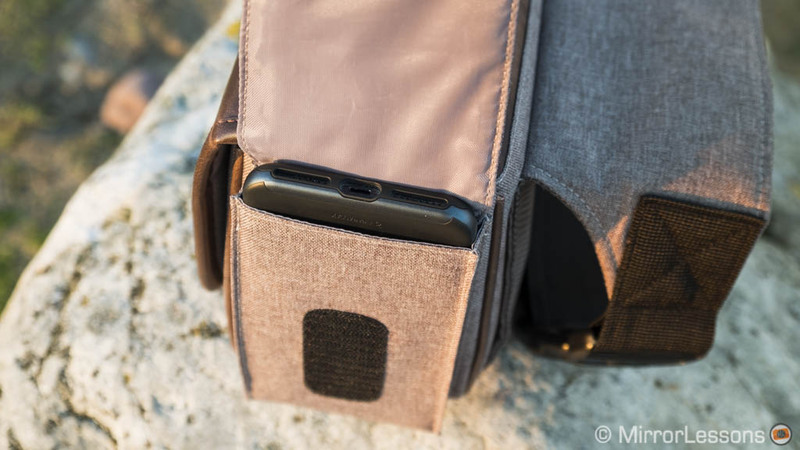 The Streetomatic+ comes with a belt strap: you attach the bag around your wrist and secure it with the hard platstic buckle. The size can be adjusted between 75 and 125cm thanks to the velcro present on the strap. 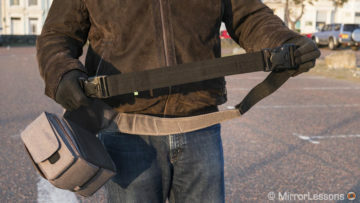 If you want to carry it as a normal shoulder bag, there is a strap extender that increases the length to 165cm. 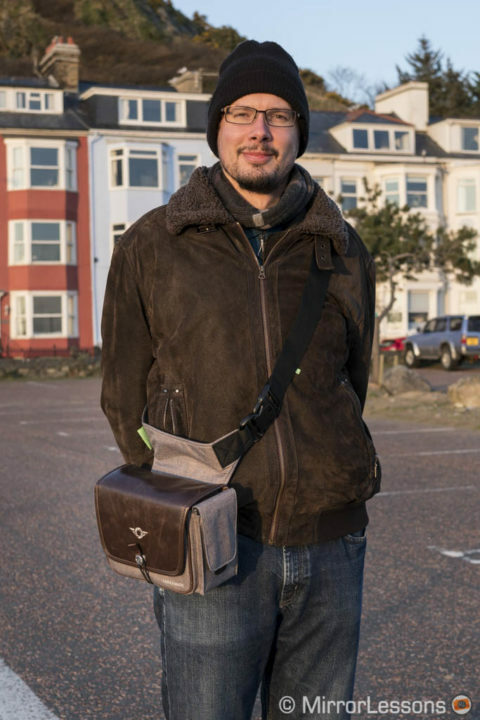 With previous Cosyspeed bags, I always preferred the belt-carrying solution but since the Streetomatic+ is larger and heavier once the gear is inside, I found myself using it more and more as a normal shoulder bag. It can be a very nice solution for someone wanting a small and nice-looking bag to carry around. 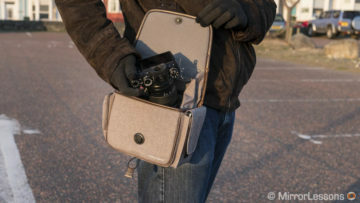 The Streetomatic+ is the largest Camslinger bag from Cosyspeed. It retains most of the features found on the smaller Streetomatic but with a refined design that makes it the most beautiful in the series. 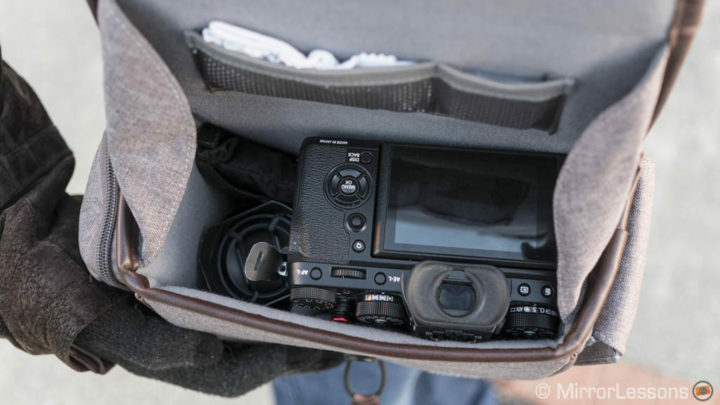 It can even accommodate a DSLR such as a Canon 5D IV with 24-70mm 2.8 attached. 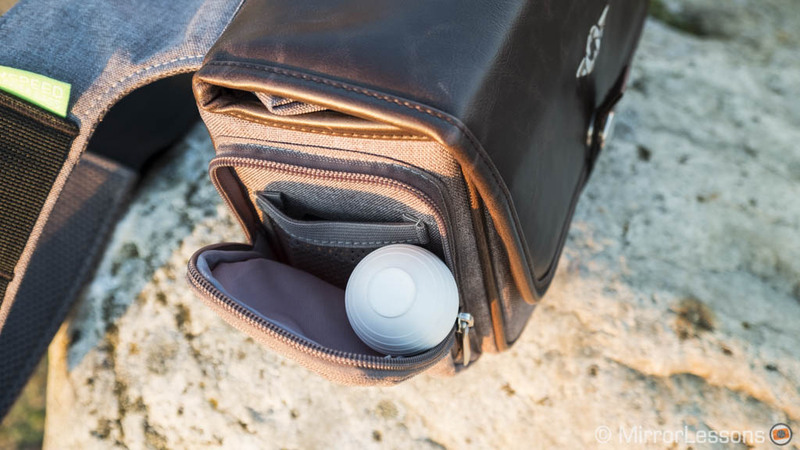 You can use it to carry one camera and two lenses maximum (depending on their size) or you can use it to carry around additional lenses or accessories while carrying your camera with a traditional strap. The belt extension and the possibility to use it as a normal shoulder bag makes it more versatile than ever before. 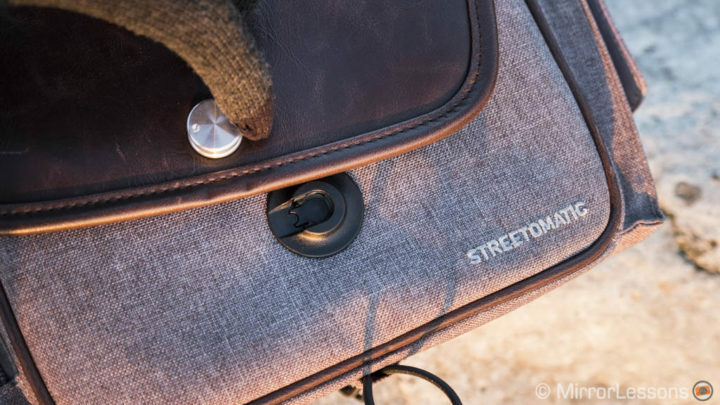 The Streetomatic+ is also the most expensive of all the Cosyspeed bags with a retail price of $130/€129 which could put you off if you consider that the regular Streetomatic can be found at half the price. The key aspect here is of course the extra size and space: with the Plus version I can carry a larger lens such as an all-purpose zoom. With the regular Streetomatic I managed to include just one or two prime lenses.